Clean the fish pieces. Mix kashmiri chilli powder, turmeric powder, pepper powder, ginger-garlic paste and salt into a paste adding little water. Marinate the fish with the paste and keep for half an hour. Yummy fish!! Very much tempting.. Perfect side dish with dal and rice. I never get this when I fry my fish. thanks for the recipe and hopefully I'll be able to get as close to yours as possible. Love eating this fish immediately after it's fried as you can get the crispiness of the skin..wonderful! Seems simple to make and looks lovely here. 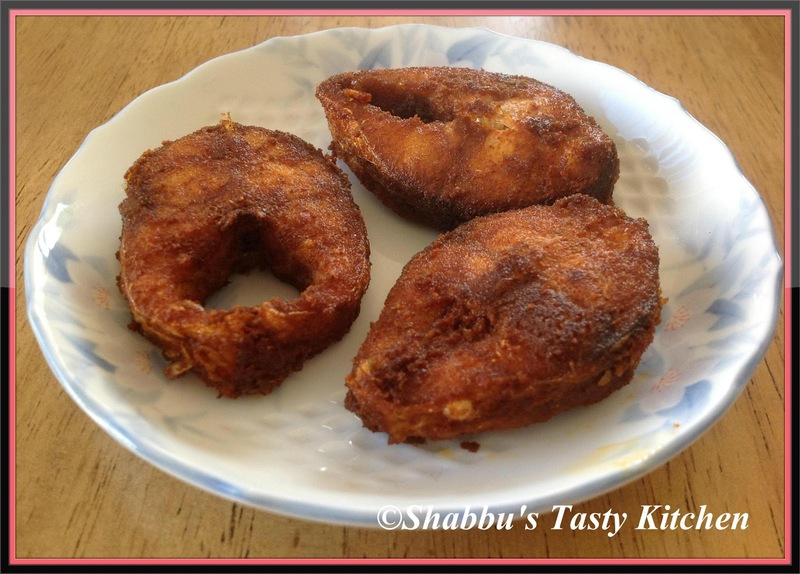 Delicious fish fry,yummy with rice!! hi Shabs the fish look perfectly fried. This is such a beautiful post,yet simple. Super tempting...Fish fry looks awesome! First time here from Kerala Kitchen Event..Congratulations for the award. Your fish fry and my stir fried chicken recipe are almost the same but I think your recipe was much more delicious on the one that I made. Thanks for sharing it here.